The future of implant surgery is seated in the use of biomaterials and tissue engineering, and this book offers a clear synopsis of research and clinical protocols for this topic. Presented by a distinguished group of international authors and based on 30 years of research, this book informs clinicians about bioactivating concepts from both scientific as well as clinical perspectives. The research findings detail bioactivation of bone morphogenesis and regeneration by bone morphogenetic proteins, biomaterials and bone repair, bone and soft tissue engineering, as well as cellular and subcellular physiology. Clinical chapters focus on intraoral surgical techniques, including step-by-step procedures for hard and soft tissue management for ideal site development and perio-implant prosthetics. 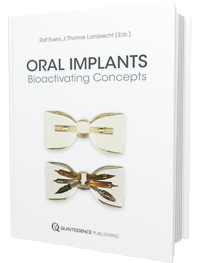 This exceptional book provides a comprehensive overview of the use of bioactivating concepts in oral implantology that will both ensure the best possible esthetic and functional results and provide insight into the future of scientific and clinical research. Marx, Robert E. / Stevens, Mark R.
Due to the growing demand for dental implant-related ridge augmentation procedures as well as tumor- and trauma-related reconstruction, expertise in bone graft harvesting remains crucial. This book presents the essential knowledge of material structure and properties and shows how to apply the framework of material science to restorative treatment plans. This didactic approach will enable students to select appropriate materials and handle them correctly for optimum clinical performance.